(PhysOrg.com) -- Antennas aren't just for listening to the radio anymore. They're used in everything from cell phones to GPS devices. Research from North Carolina State University is revolutionizing the field of antenna design - creating shape-shifting antennas that open the door to a host of new uses in fields ranging from public safety to military deployment. The antennas consist of liquid metal injected into elastomeric microchannels. are dictated by the elastomer and not the metal. Modern antennas are made from copper or other metals, but there are limitations to how far they can be bent - and how often - before they break completely. NC State scientists have created antennas using an alloy that "can be bent, stretched, cut and twisted - and will return to its original shape," says Dr. Michael Dickey, assistant professor of chemical and biomolecular engineering at NC State and co-author of the research. The researchers make the new antennas by injecting an alloy made up of the metals gallium and indium, which remains in liquid form at room temperature, into very small channels the width of a human hair. The channels are hollow, like a straw, with openings at either end - but can be any shape. Once the alloy has filled the channel, the surface of the alloy oxidizes, creating a "skin" that holds the alloy in place while allowing it to retain its liquid properties. therefore a wireless sensor of mechanical deformation. "Because the alloy remains a liquid," Dickey says, "it takes on the mechanical properties of the material encasing it." For example, the researchers injected the alloy into elastic silicone channels, creating wirelike antennas that are incredibly resilient and that can be manipulated into a variety of shapes. "This flexibility is particularly attractive for antennas because the frequency of an antenna is determined by its shape," says Dickey. "So you can tune these antennas by stretching them." While the alloy makes an effective antenna that could be used in a variety of existing electronic devices, its durability and flexibility also open the door to a host of new applications. 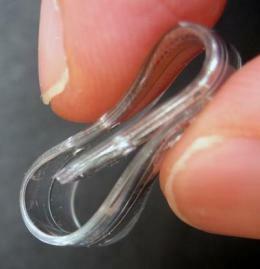 For example, an antenna in a flexible silicone shell could be used to monitor civil construction, such as bridges. As the bridge expands and contracts, it would stretch the antenna - changing the frequency of the antenna, and providing civil engineers information wirelessly about the condition of the bridge.